At the end of my first guest blog I had learned from John Crouch’s friend Ray Hearne that another of their mutual friends might have more manuscripts of John’s compositions. Well, that tidbit of information has turned into a fascinating flood of new revelations about our good friend John. 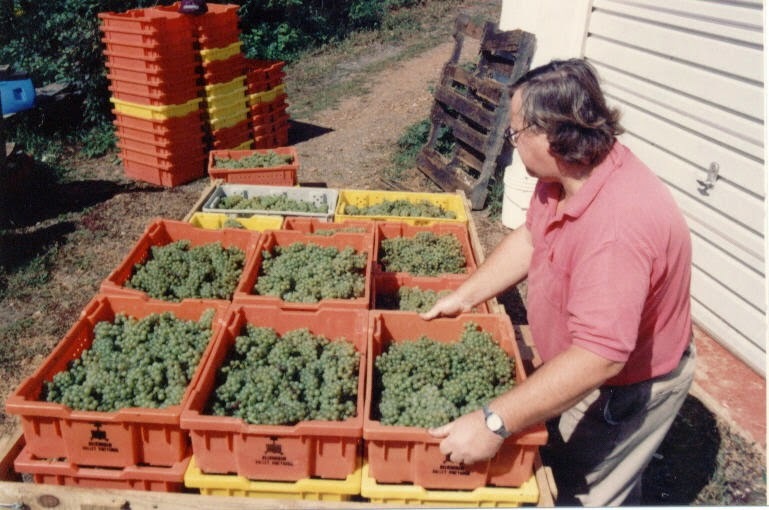 About the time we finally made the Tony Norris connection by email everyone at Allegro was fully into harvest season mode, about which Carl has recently written. So it was only last Friday, a week before Christmas, that Carl and I were finally able to trek down to Baltimore to meet Tony and Laura, learn more about John, and bring back the two boxes of John’s scores for which Tony had generously offered to allow us to become custodians. That trip would have been a highlight event for us, even if it had only consisted of being hosted in Tony and Laura’s historic restored home a block from the waterfront and at Bertha’s, their successful creation. They are iconic beings, fascinating beyond description. But between our hours of conversation with them (accompanied by Bertha’s food and Allegro’s wines) and the boxes of materials we now have in hand here on the estate, I have come to have a new appreciation for John Crouch, musician. Furthermore, what I’ve learned from the bio is that during his early years in DC John learned to play multiple instruments—cello, string bass, tuba, oboe, flute, clarinet, and sax, and then "majored in music at Boston University, studying oboe with Ralph Gomberg.” (italics mine) Well, since I spent several decades in the orchestral world I am well aware that Ralph Gomberg was the principal oboist for nearly 4 decades with the Boston Symphony Orchestra. (His brother Harold held the same chair in the NY Philharmonic). That, my friends, is that same Theme and Variations whose first page of manuscript sits on the front of Allegro’s 2012 Bridge!! Perhaps, if Carl will have me, I’ll someday submit another blog about John the composer, once I’ve had a chance to spend time with the two boxes of scores Tony passed on to us. But I’ll close out this one with a family aside, growing out of our encounter with Tony and Laura Norris. Our son David earned his bachelor’s degree at the Eastman School of Music as a horn major, though he is also a violinist and, like John, has learned to play many other instruments. For the past half dozen years he has become a very serious mandolin player. He and a colleague have performed extensively on the east coast as a guitar/mandolin duo (and also released two CDs as Prester John), and he is part of a select mandolin ensemble, (New American Mandolin Ensemble—NAME) which this summer represented the United States at a major conference in Germany. Well guess what? Tony and Laura Norris are two of the four members of the Baltimore Mandolin Quartet, and both are active in the Baltimore Mandolin Orchestra. Laura has founded a significant “Mando Kids” program for young people which is becoming utilized throughout the country----David was well aware of it. And the three of them, without knowing each other, have performed together in at least two large ensembles at national conventions. Talk about multiple interwoven connections! John must be smiling! Great article. I remember during my many visits to Allegro, I would love to discuss music of all types with both John and Tim. It made our visits there all the more complete (great music and great wine, what a wonderful combination). I also came from a musical background of sorts. My father was not only a piano tuner, but a very fine jazz pianist and remember the many nights that fellow musicians in the neighborhood would gather in our apartment to jam into the early morning hours. I also played piano, accordion and trumpet (the latter not as well as the others) and practically lived in the music department at my high school where I sang in three of the schools choruses. It turned out that my love of photography proved to be greater, leading to my ultimate career choice. I don't regret that decision, as music will always be a part of my life. It was just nice to be able find a way to combine that love with my love of wine. John, Tim (and Dudley, their "crazy" dog, we miss you so much and thank you for creating such a unique wine experience and thank you Kris and Carl for continuing that experience. Thanks for the memory, Harvey. Music is still a large part of what we are here at Allegro. Nelson (our vineyard manager) was a professional violinist for years), and our family (Kris and her folks) are as musical as I've seen. I, on the other hand, bang around on my guitar, but love it nonetheless. It's crazy to think that the theme of music has been with Allegro for so long. Thanks! Great Page. My father, Paul Durbin and I were close friends of the crouches from the early 70's, when John and Tim owned the music store in Riverdale, Md, until their untimely deaths. 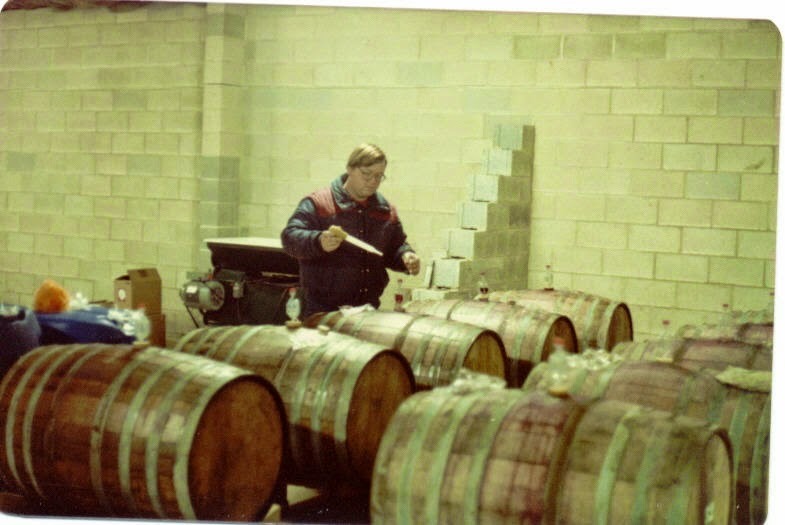 My father and I spent many happy hours helping the Crouches prune, harvest and process grapes for many years. I studied alto saxophone and flute with John.